GUNNISON—A pair of historic homes stand as prominent pillars of Gunnison’s historic roots and open windows to memories of yesteryear. The homes, standing on the north end of Main Street, were built by two brothers, Lafayette and James Bown. The brothers built their homes a year apart. Lafayette, who his friends called “Lafe,” built the Bown Villa at 132 North Main in 1898, and James built his home at 168 North Main in 1899. Both homes have different styles, but they were designed by the same architect from Nephi, whose name is unknown today. The Bown Villa features many elements of Victorian Eclectic styling, including “an unusual if not unique double-roofed corner tower, a formal entry through a portico of paired columns [front porch], multiple roof forms and a tall, stately overall appearance,” according to a description on www.Sanpete.com. The James Bown home, also a Victorian Eclectic, has a large portico and entrance hall, front parlor and dining room. It was built with red sandstone from a quarry near Fayette. 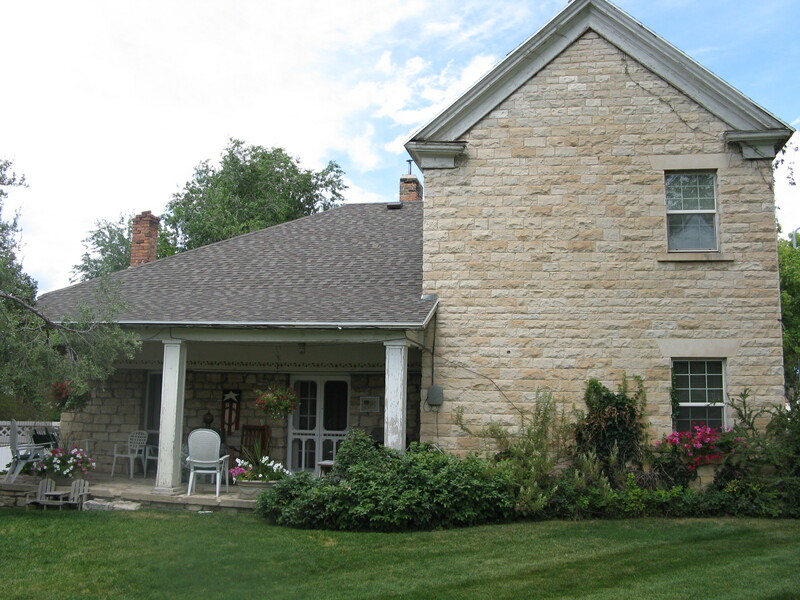 The foundation is oolite limestone extracted from the same rock quarry used for the Manti LDS Temple. Its dark red bricks were manufactured in Manti. The Bown brothers tended 10,000 sheep on the open range in Utah, Idaho and Colorado. Two hundred sheep usually grazed in a pasture behind the two homes. Before Main Street was built, a large canal ran in front of the two homes. A small indentation in the gravel driveways is all that remains of the canal today. James, whose home is still owned by his family, was financially successful and played an important role in building the community of Gunnison. Lafe, although he lived in Gunnison for decades prior to building the Bown Villa, was forced to move north within 10 years of completing the home, says Marie Sanders, great-niece of Lafe and current owner of the James Bown home with her husband Kent. Another family inhabited the Bown Villa for almost a century before passing it to its current owners, Bill, Charlotte and Shawn Christiansen. Lafe Bown’s home was purchased by Payton and Bessie Alexander in 1929 shortly after they were married. Payton accepted a job in Gunnison as a high school coach and later served as the high school principal for many years. Bessie Alexander was born in 1908 to Hyrum and Julia “Jule” Hatton in Provo, where she attended Maeser Elementary School and Provo High School. She also attended BYU, where she majored in physical education and dance and met her husband. Bessie lived in the Bown Villa throughout her married life. Only in the last 10 years of her life did she move to California to live closer to her daughters. She died in 2009 at the age of 101. Payton and Bessie boarded school teachers in their home, including Wanda Welling, Faye Hills and Jenny Duke. The Alexanders had three daughters, Jewel, Patsy and Joann. Jewel vividly remembers her happy childhood in the Bown Villa. “Patsy and I played on a small bed [on the front porch] with our girlfriends. We played with paper dolls, colored, read and played board [games] and card games. This would continue until one of the dogs would leap on the bed and disrupt everything,” she recalls. 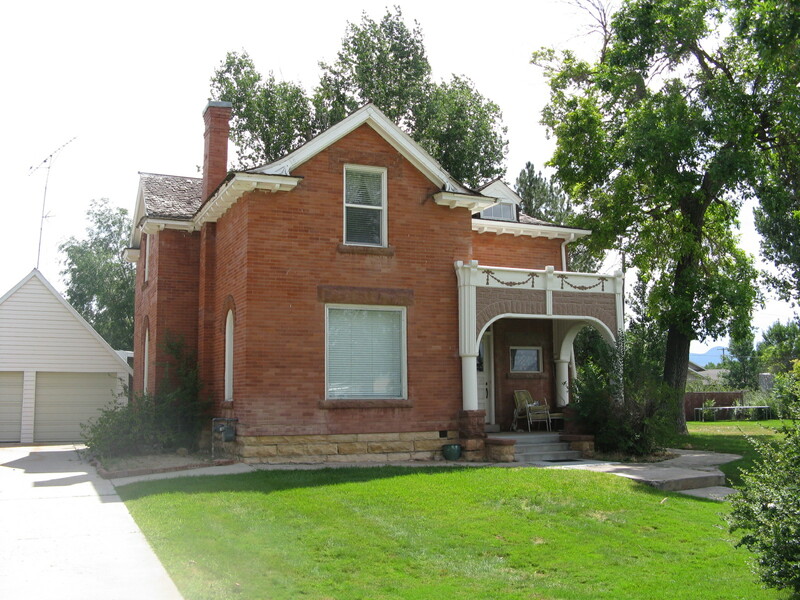 Charlotte Christiansen, a long-time Gunnison resident, knew the Bown Villa only as “Bessie’s House” before she purchased it with her husband Bill and son Shawn in 2002. Charlotte Christiansen’s real estate office was around the corner from the house for decades, and she knew Bessie well. When Bessie moved, she sold the house to Charlotte. “She knew we would maintain it,” Charlotte says. Shawn Christiansen spent the last decade restoring and updating the home. He painstakingly stripped the walls of seven or eight layers of wallpaper and restored the baseboards. He added central air and updated the electrical wiring. He also restored the main stairwell and the roof’s original wood-shake shingles. Shawn added a bathroom to a bedroom upstairs and modernized the kitchen. Payton and Bessie Alexander had used what now is the dining room as their bedroom, which had a separate door to the bathroom and kitchen in the back of the house. Bessie painted the bathroom bright pink and adorned it with lace drapes. Charlotte and Shawn Christiansen have maintained the bathroom as Bessie left it. Shawn also found an original stained glass window in the chicken coop and placed it in the front room. Today Charlotte and Shawn Christiansen use the Bown Villa as the offices of their real estate brokerage. They also hold family reunions and permit visiting family to stay there. James and Lafe were two of the 10 children in the William Bown and Jane Ann Metcalf family (only six sons lived past 1900). Many of the offspring lived in Fayette where a fort providing shelter from the Indians was located. Some of the Bowns tried settling in St. George, but a flood one year ruined their crops. The Metcalf family rescued the St. George Bowns and brought them back to Fayette. James and Lafe were able to settle in Gunnison once challenges with the Native Americans had subsided, but their successful sheepherding business was compromised when landowners began fencing their properties. Sheepherders couldn’t lead their sheep across various properties anymore. When James’ and Lafe’s sheepherding business folded, Lafe moved to Provo, but James maintained his residence in Gunnison and changed his profession to banking. A room upstairs in his home was used as an office, says Marie Sanders, a granddaughter of James Bown. James Bown helped organize the Gunnison Telephone Company as well as the Citizen’s Bank of Gunnison and Centerfield. Both of Marie’s parents also worked for the telephone company. The phone company is now managed by Kent Sanders and his son, Jim. James and his wife, Florence Bartholomew Bown, raised five daughters in the home. James told Florence she could have either an indoor toilet or a fireplace in the home. Marie, the only child of Howard and Vera Jane Bown Norman (Vera Jane was a daughter of James and Florence). She lived in the home as a girl. “The bathroom upstairs used to be my bedroom,” Marie says. There was a vent in the dining room that heated the upstairs, Marie recalls. The north room in the home was the music room. An archway in the music room separated it from another room that James and Florence used as their bedroom, which had blue and purple drapes. When the Sanders moved in, they “got rid of the drapes and changed the bedroom into a TV room,” Marie says. Today there are three bedrooms upstairs, one big room and two smaller rooms. One of the rooms still has the original furniture. They cut one wall to make drawers and cupboards. What used to be the large downstairs bathroom with a claw-foot bathtub is now a smaller bath with a shower only and a separate washroom. Is there a connection between Florence Bartholomew Bown’s family and Byrd Bartholomew, who married Jewel Alexander next door? Byrd Bartholomew’s grandfather (George Marston Bartholomew) and Florence Bartholomew’s father (Joseph Bartholomew) were brothers—both sons of Joseph Bartholomew and Polly Benson. The Christiansens have heard that the wives of James and Lafe were sisters, but the truth is they weren’t (since Lafe was married to Clarissa Jane Dack—not a Bartholomew). However, the oldest brother of James and Lafe (William Bown) was married to Elizabeth Almira Bartholomew, a daughter of the same Joseph Bartholomew and Polly Benson. And even though the wives of James and Lafe weren’t sisters, they treated each other like sisters: “The brothers didn’t get along, but the wives were good friends,” Shawn says. It is clear that both Bown homes have been well loved and treasured through the years, continuing to memorialize those who have gone before, along with providing those in the present with pleasant places for memory making—and reminiscing. 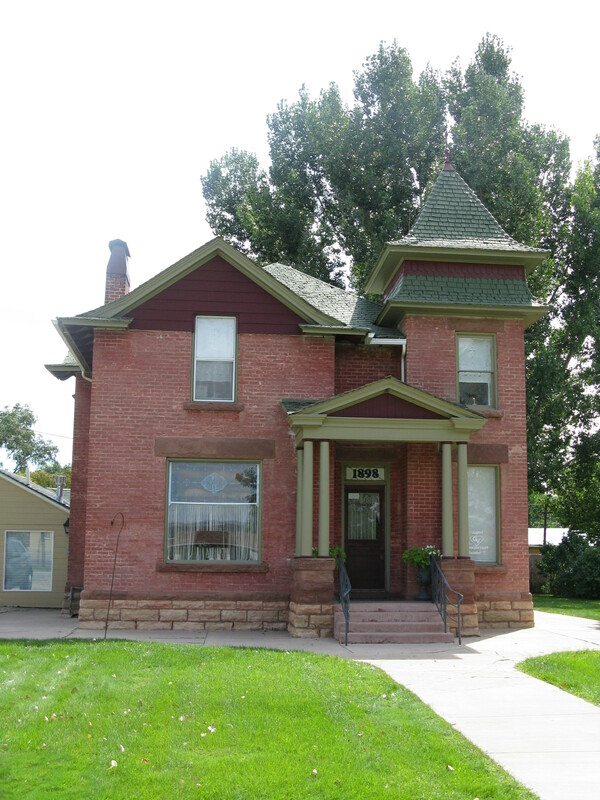 Editor’s Note: This is another in an intermittent series of articles about historic homes in Sanpete County and the people who have built, restored and lived in them, past and present. MANTI—In 1903, fire erupted with a loud boom in an upper northeast room of the Bench Hotel on Main Street in Manti. A Mr. and Mrs. Stuttz, who were staying at the hotel and who ran a theatrical company, had been preparing something to be used as lights in their show that evening. They forgot an essential ingredient, and the mixture exploded. Mr. Stuttz was able to escape and then returned to the building to try to rescue his wife. He severely burned his hands as he opened the flaming hot doorknob. His wife was badly burned and in shock. She died a few days later. “The hands of Stuttz were so severely burned that it was weeks before he was able to feed himself or join his (theater) company,” says Jennie B. Cox in a four-page typed history of the Bench Hotel written in 1960. Jennie Cox was the daughter of George Edward Bench and Jane Hortin. After their marriage in 1863, the couple built a two-room adobe cabin on the northwest corner of 300 South and Main Street. Bench added onto the home in stages. Two rooms were built with hand-cut stone bricks above the adobe cabin to provide room for the Benches’ 10 children, seven girls and three boys. The couple started the Bench Hotel as a means of making income for their large family. Ultimately, eight more bedrooms and a bathroom were added. Today, the house only has three bedrooms. Most of the portion of the house that burned was never rebuilt, so no one knows what the structure looked like in its full glory, says Donna Birk, who purchased the home with her husband, Doug, in 1990. Today the home includes the two original upstairs bedrooms and a third bedroom on the main level. A smaller room at the top of the stairs was once a closet, but the Birks converted it into a two-level playhouse for their children. The original two-room adobe home is the Birks’ living and dining rooms, boasting 12-foot ceilings. The 2-foot thick walls are apparent in an arch with original oxblood stain that was cut out to connect the adobe rooms with the rest of the house. Behind the dining room are a kitchen and the mudroom, which the family uses as a TV room. When the Birks moved in, the hardwood floors were covered with light blue shag carpet. They have restored the floors in the front rooms. “We raised four girls here,” says Birk. Now the bedrooms in the home are used to house Birk’s visiting grandchildren. One of the home’s unique features is a large attic above the back of the house that can be reached through a door in an upstairs bedroom. Birk believes the attic space housed some of the bedrooms in the old hotel. Faded wallpaper covers the lathe-and-plaster walls of the attic. The attic floor is not strong enough to walk on, and the sky peeks through some of the roof’s shingles. Birk plans to restore the space as a family room. The Bench Hotel opened for business in 1887 or 1888 and ran for 17 or 18 years, according to Cox’s history. Patrons included boarders who lived there for years and guests who stayed only while they were visiting in town. Some of the more famous guests were George Albert Smith and Joseph F. Smith, who later became presidents of the LDS Church. “The two older boys, George and Frank, ran a livery stable in connection with the hotel,” Cox continues. The stable took care of horses, including some that pulled a “hack,” or a three-seated buggy to providing patrons with transportation to and from the train station. “The rooms in the hotel were all neatly furnished,” Cox writes. “The office contained a table, chairs, couch, an organ (the first one in Manti) and a stove to supply heat in the winter. There were no furnaces at this time. Each bedroom contained a double bed, chairs, and a small table that held a kerosene lamp. There was also a washstand with a pitcher and bowl, as well as soap and towels. A commode was kept in a drawer of the washstand. Floors throughout the house were covered with homemade rag carpet with straw underneath as padding, typical of homes in Sanpete County because fashionable rugs were too expensive. But some guests felt rag carpet wasn’t good enough. “One evening, a traveling salesman came to the hotel intending to stay,” Cox recalled. “When he opened the door and looked in and saw a rag carpet covering the floor, he said, ‘<Expletive>, rag carpet!’” The salesman left immediately and stayed at another hotel. “I suppose, in the meantime, he must have gotten used to rag carpets because the next time he came to Manti, he came to the Bench House and was a very nice guest,” Cox writes. Other prominent guests included H.R. Kerr, superintendent of the Sanpete Railroad; James W. Cherry, an attorney; L.A. Lauber, publisher of the Sanpete Democrat, a weekly newspaper; H.C. Jacobs, who later managed the Jacobs Mortuary in Mt. Pleasant; as well as a number of educators. The hotel closed within a year or two after the fire in 1903. During the 1900s, the house passed through a handful of owners, including Jay and Laurie Olsen and Thera Lou Hickman. It served as a dentist’s office for a time. This year marks the home’s 150th anniversary. Many memories are associated with the structure. Just one example: The late Betty Anderson, who was Birk’s neighbor in her elderly years, remembered jumping from a second-story window onto a mattress in the front yard one hot summer day with a number of other children, probably when parents home were away. And the covered patio on the south side of the house is a place to rest after a long day at work. Unquestionably, the ivy-covered edifice will remain a Manti icon for years to come.